2012 is perhaps the most tiring and wonderful year of my life. A lot of things happened to me this year, some are good and some are bad. I think most of them are common problems in human life, nevertheless they taught me valuable things in life. My faith in some things were tested, I let go of things that I consider important in my life, I accept a reality that I should’ve been accepted years ago, and I have to made a tough decision that I never doubt for a second that it was also the right decision. I don’t expect people around me to understand or even respect my decision, I am proud for all the decision that I made, for stand up to something that I believe in. Sometimes it takes a lifetime to to learn the important lessons, for me it seems to have come upon me all to quickly. Now the good things that happen in my life this year, some of them are something that I don’t even dare to dream and the rest are something that I’ve been working hard to achieve. I got my college degree after a lot of tears, hard work and months of sleepless nights doing my thesis. I let go a few people that I truly consider as a friend, but hundreds (yes, hundreds) of wonderful people has come into my life this year. I’ve met some of the kindest, most generous people; I am eternally grateful and blessed to have all of you in my life. Thank you for all the lesson I’ve learned from you 2012. 2013, BRING IT ON! I’m ready for whatever you have for me. Happy New Year, everyone! 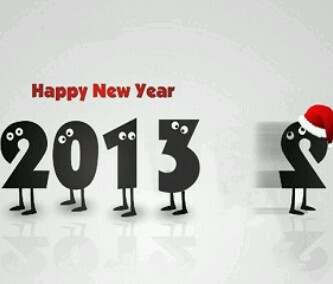 May the year of 2013 be a year of health and happiness. And also a year of love and laughter.